When you step out of a nice hot shower or bath, it seems like the world has suddenly started a global cooling cycle! Instead of standing there shivering, a warm towel can help you dry off and warm up. That’s just the start of the benefits you’ll experience when you own one of the best towel warmers that are available today! There are a few different designs of towel warmers on the market today. Some are made with a variety of materials. This chart will help you quickly determine which towel warmers will work for your home so you can make an empowered decision! A towel warmer is a bathroom appliance that does exactly what its name implies. When you place a towel on the warming rack or put it into the warming machine, you’ll quickly have towels that feel like they came out of the dryer! That means you’ll be able to dry off in warmth instead of having to rush through the process shivering. Towel warmers also work to dry off a towel more effectively than air drying the towel in the bathroom. The bathroom is a moisture-rich environment and that water vapor from your steam shower can linger in there for quite some time once you step out of it! That makes it nearly impossible for your towel to completely dry. Where there’s moisture, there’s mildew and all sorts of other little, sometimes smelly growing things. Towel warmers will dry your towel quickly and keep a more sanitary environment for you. That means when you’re done with a washcloth or a hand towel, you simply place the towel on the drying rack and then the machine does the work for you! If you’re getting a free standing unit, the heat from the towel warmer will also help you control the overall level of dampness in your bathroom so that moisture is controlled even more. If you’ve got nails slipping out of your ceiling drywall or your paint is starting to crack, this bathroom appliance will help you quickly stop the cycle of moisture so that your home retains its value. What Are the Advantages of a Towel Warmer? Although the initial consideration is to place a towel warmer in the bathroom with a steam shower or a bathtub, towel warmers can also be an integral part of any room that has moisture in it. That means the kitchen, the basement, a bedroom, or even the entry way into your home could all benefit from having a towel warmer installed! You’ll also be getting a stylish addition to your room. Although the compact towel warmers where you place the towel inside the machine are reminiscent of a microwave oven, the rack variety are quite tall and elegant. They bring a professional level of comfort into your home that replicates what you would experience at the spa. For many, the question isn’t whether they should get a towel warmer: it is determining how big of one they should get! Towel warmers also have the advantage of being portable if you need them to be. Although a bathroom installation would typically benefit from a hard-wired installation to prevent moisture seeping into the electrical current, a portable towel warmer can be placed virtually anywhere, give you the warming technology that you need for that given moment, and then placed in a new location. How Do You Find the Best Towel Warmer? Finding the best towel warmer means first knowing what type of bathroom appliance you’re going to need. There are two main types of this bathroom appliance to consider: hydronic or electric. The hydronic towel warmers connect directly to your home’s plumbing system. You simply route the hot water through the appliance and then back into your plumbing system so you don’t lose all the heat from your hot water. Hydronic towel warmers are the best for energy efficiency, but they are also the most difficult to install. Most bathrooms or homes would need some level of modification to install this bathroom appliance. That’s why many home owners opt for an electric towel warmer. These can be installed directly onto the wall or be a portable standing unit, much like a space heater. The best towel warmers have a thermostat on them so you can control the temperature adequately and will also have some level of automatic functioning so you won’t have to worry about forgetting to turn this appliance off like you do with the coffee pot! If you have limited floor space, however, a wall mounted towel warmer will likely be the best option. It offers the most space savings, provides the largest benefit, and still looks sleek and stylish! What Are the Prices For Towel Warmers Today? The good news is that there is a towel warmer that fits into everyone’s budget right now! Most budget friendly towel warmers are priced on Amazon for less than $250, but you’ll still receive a first class experience. Top of the line towel warmers can be as much as $3,500, although that’s typically a professional spa quality appliance at that price. The average price you’ll pay for a quality unit for your home today is about $185. Which one works best for you? That’s where our reviews can really help! You’ll get the facts you need about each towel warmer so you can select the right combination of price, form, and function for your home. If you’re looking for a towel warmer that will heat quickly and dry your towels in no time at all, then this is the bathroom appliance you’re going to want! Made of stainless steel that is 18/8 grade, you’ll get 10 crossbars that will allow you the optimum level of drying space for each towel. There’s enough room to dry two full-sized towels, all of your washcloths, or about four hand towels at the same time. The horizontal and vertical bars are all heated and you can control the heat on this wall-mounted appliance with a simple flick of an on-switch. It’s a high quality, durable towel warmer! Click here to compare prices on Amazon and get the best deal on the Amba Radiant Hardwired Curved Towel Warmer. If you’re looking for a portable towel warmer that will still effectively warm up all your towels in any room, then this is the one you’ll want to get. It comes in two finishes and offers 80 watts of power in a floor standing unit. It’s large enough to fit two full-sized towels plus has room to spare for a couple washcloths and a hand towel if need be. There’s a one year limited warranty included with this cost-effective towel warmer and it’s gentle enough to let you dry your hand washables, baby blankets, and other delicates with ease. Click here to compare prices on Amazon and get the best deal on the Warmrails Hyde Park Towel Warmer. If you’re looking for a freestanding towel warmer that has the solid look of a professional appliance, but for a fraction of the price, then this is the best appliance to get right now. You can save up to 52% off the MSRP on a site like Amazon right now, get the portability that you need, and there’s a 6 foot cord with dry lined power so you can get the safe heat you need. You’ll sacrifice some heating speed to save on cost, however, as it takes about 30 minutes for this towel warmer to reach it’s full heat. Click here to compare prices on Amazon and get the best deal on the LCM Home Fashion Freestanding Towel Warmer. If you’re looking for a touch of luxury at any given moment, then the 120F that you’ll get from this towel warmer will give it to you for a fair, competitive price. It warms up within 10 minutes and is large enough to accommodate your towel and your robe if you want! It also offers an auto shutoff so you won’t have to worry about leaving it on too long. Warm up your gloves or hats before going outside on a winter day with the silicone heating element! The transparent lid is nice, but the design itself is reminiscent of a trash can. That’s the only real down side to this specific towel warmer. Click here to compare prices on Amazon and get the best deal on the Brookstone Towel Warmer. If your space is at a premium, then this towel warmer will help you get the warmth you need in a space that you can handle. This is a wall-mounted appliance only that comes in two finishes, but won’t finish off your savings account when you purchase it! Powered with 105 watts, you can choose to either hardwire or softwire options for your convenience. It’s not really big enough to dry your bedding, but it is suitable enough to dry your hand washables and your towels quickly and installing it takes no time at all. Click here to compare prices on Amazon and get the best deal on the Warmrails Kensington Wall Mounted Towel Warmer. Do you want a towel warmer that will give you some basic warming, but some incredible style? This mid-size appliance offers enough space to warm one full-sized towel on 75 watts of power. It’s a portable unit, floor-standing, that can be placed close to a wall if need be so that it is out of the way. Gentle enough to dry your delicates, but strong enough to dry a wet, oversized towel, the benefit of not needing to worry about oils or liquids is immediately on display! It will definitely turn your bathroom into your own private spa. Click here to compare prices on Amazon and get the best deal on the Warmrails Mid Size Wall or Free-Standing Towel Warmer. Do you want to add an extra element of design to your bathroom? This curved towel warmer offers you an incredible amount of space, heats quickly, and an optimal level of drying space. Made of stainless steel, even the vertical bars heat up on this wall-mounted unit. You can flip the on/off switch to control it if you wish, use the 24/7 programmable options to heat it, or just plug it in when you’re ready to heat it up. It’s powered with 150 watts, so there’s lots of good heating that happens fast with this towel warmer! Does your bathroom shine with the look of oil-rubbed bronze? This towel warmer will compliment your look and still give you an amazing experience. With a temperature range that reaches 154F and a built-in thermostat with a thermal cutout that is automatic, you’ll still be able to optimize your energy consumption. It’s made of stainless steel, offers a depth of 4.5 inches, and it can even be customized so that it is wired on the left instead of the right. You can also customize this model to be hydronic if you prefer for this wall-mounted unit. All in all, this towel warmer gives you the result you want at a price that is surprisingly affordable for this quality. Click here to compare prices on Amazon and get the best deal on the Jeeves Straight Towel Warmer. Are you looking for a towel warmer that will give you a lot of flexibility with its design? This towel warmer is one of the few that is actually mounted on a hinge, letting you swing each arm independently of each other up to 180 degrees. This wall-mounted unit heats up to 136F and has an integrated power switch on the warmer with its own pilot light. 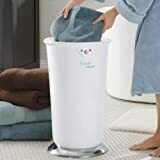 At 37 inches long and 25 inches wide, you’ll have plenty of drying space and the extra swiveling function keeps the towels away from each other. It’s a great appliance, a great value, and you won’t have musty towels any more! Click here to compare prices on Amazon and get the best deal on the Jeeves Swivel Jill Towel Warmer. Is your space limited, but not your focus on elegance? This oil rubbed bronze towel warmer is about half the size of the typical towel warmer for the home, but it still gives you full power! It’s large enough for one full-sized towel or two hand towels and mounts directly on the wall. The temperature automatically cuts off at 158F for safety and maintains a good 145F average base so that your towels can quickly dry. It installs easily, looks great, and will give you the warm towels you want! Click here to compare prices on Amazon and get the best deal on the Jeeves Amba Towel Warmer. If you’re ready to experience a higher form of luxury when you step out of your steam shower or a warm bath, then you’re ready for the best towel warmer that’s available today! Take a look at these options, use this guide to evaluate your needs, and you’ll be ready to make an investment into yourself and your home! Previous PostReader Question: Shower Head for High Water PressureNext Post Here Are the Best Shower Faucet and Fixture Reviews!